Not a combination that I’d have predicted might work musically, or even one that I could ever have conceived of. But I guess that’s the world we live in today. 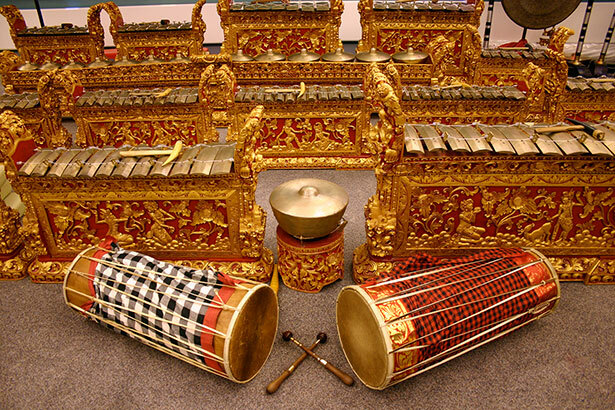 Where any old maverick NY-based producer can collaborate with a crazy kiwi siren using nothing more than some early-renaissance skin drums and a Korean percussion ensemble. It caught my ear because of its stripped down, angular yet tribal beat. 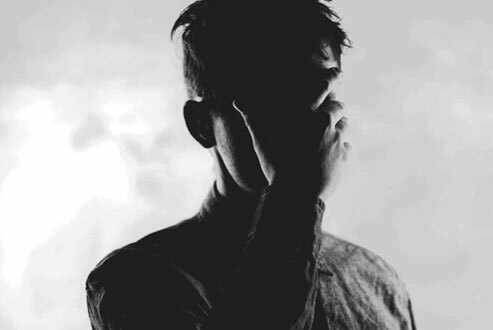 I said to Ryan I liked it, and he told me it was done with Soniccouture’s Conservatoire Collection and Samulnori Perucssion kontakt instruments. Of all the instruments featured in The Attic, the Jennings Univox and the Hammond Solovox are by far the oldest and strangest. Belonging to the same family as the seemingly better known Clavioline, the Univox ( and indeed Solovox), are designed to play what we would refer to today as ‘lead lines’ through an amplified speaker. 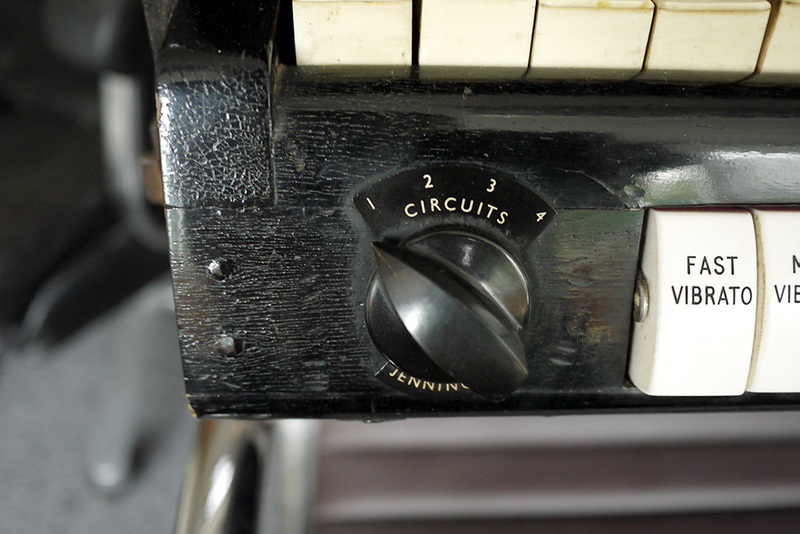 Each of the units features some kind of real-time control, in the form of a lever that can be controlled by the knee whilst playing the keyboard. In this manner, volume shaping and expression is added. As I mentioned, it seems as though the three units may be inter-changable from a historical perspective. 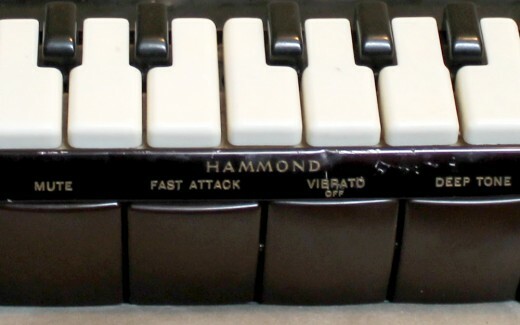 Although it is commonly held (by Wikipedia, for one), that famous records such as Del Shannon’s Runaway and Joe Meeks Telstar both feature the Clavioline, it is equally possible to find sources online that claim they were performed on the Univox or Solovox (although rarely the latter, it must be said). The fact that the three all look very similar makes it even harder to divine the truth. 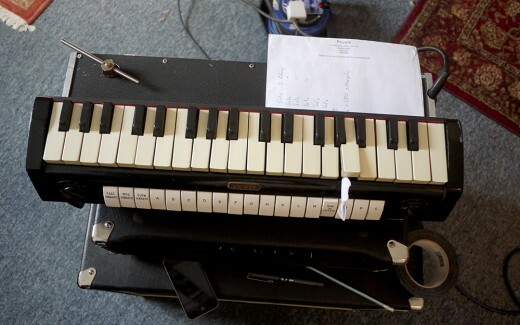 It seems as though each was simply the local version of a relatively common instrument of the time, that is : Solovox for USA/ Canada, Clavioline for France / Europe, and the Univox in the UK. 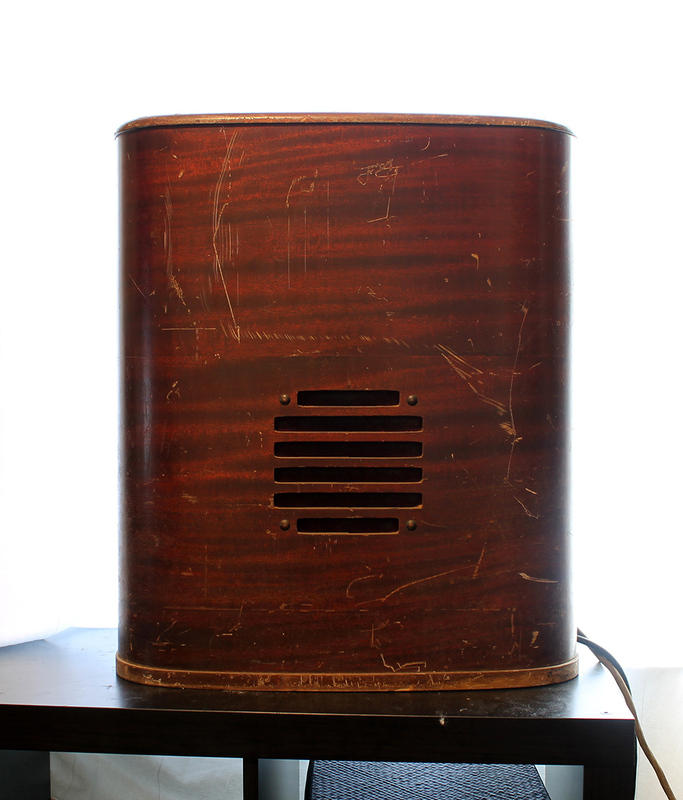 All were produced from the late 1940s until mid to late 1950s. 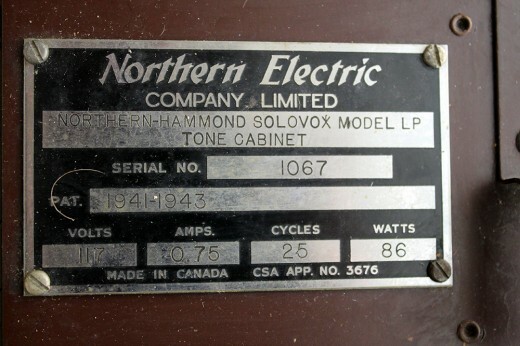 I personally only have direct experience of the Univox – The Hammond Solovox sampled for The Attic project was sourced and recorded by Dan in Soniccouture Canada (They are reasonably common there, having been manufactured in Canada by the Northern Electric Company under license from Hammond). 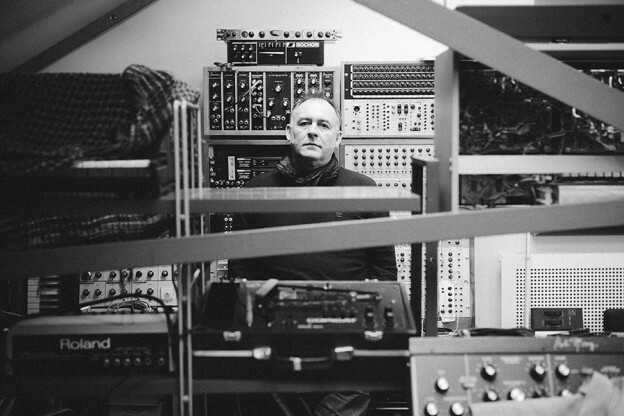 Working with the Univox confirmed what Adrian had told me – ‘it sounds like a rabid goat’. I had brieflywondered what could have prompted him to such an similie; until i switched it on, that is. It has an incredibly raw oscillator sound, the cabinet giving it its vicious edge, I assume. There’s no way of knowing for sure, because there’s no line output. Although Adrian’s Univox was in pretty good working order, it seemed, on closer inspection, that many of the switches did very little, if anything at all, to alter the sound. For this reason, we decided to have the unit serviced, to see how much of it could be brought back to good order. Ben Rossborough, of Vintagesynths.co.uk took on the job, improving the response of many of the switches. The switches largely act as filters more than extra oscillator sources – they modify the timbre of the instrument in a fairly subtle way that seems at odds with the brash, unruly sound that tears out of the speaker. He was unable to add a line output, however – as an all-valve unit, he said that this was too dangerous to attempt – these units pre-dating any electrical safety regulations. I took the Univox to Lodge Studios, Surrey for sampling – a local studio that has a very nice collection of mics with which to crowd the cabinet. 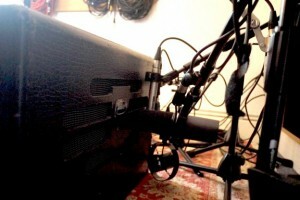 When investigating the refurbished Univox at length in my own studio, it was clear that only 6 switches had any noticeable influence on the sound, so each of these settings were sampled with 3 round-robin passes each; the organic, fluctuating nature of the oscillator feeding into the cabinet warranted some variation in the samples. The vibrato switches would be modelled in Kontakt for more flexibility. During sampling one of the very loose keys completed lost its attachment, and kept triggering when it dropped. This was propped open with a wedge of paper. The Solovox was a late addition to The Attic, which was originally going to be 9 instruments, not 10. 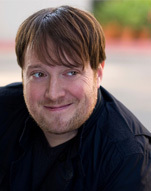 But deep in the frozen colonial outpost of Canada, Dan was offered a curiosity by the name of a Hammond Solovox. 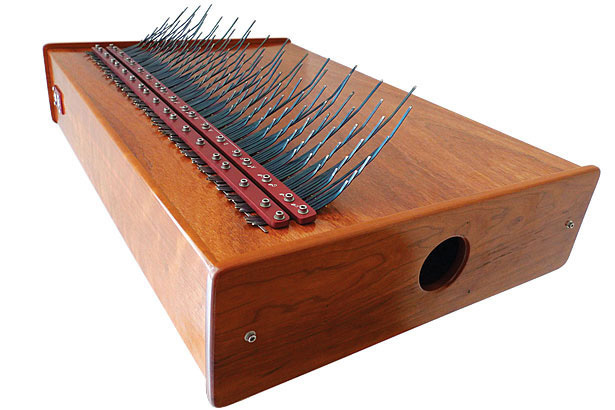 We has been unaware of these instruments, but it soon transpired that it was, as i mentioned earlier in this piece, the transatlantic equivalent of the Jennings Univox that we had already recreated as a kontakt instrument. It seemed too good an opportunity to pass up, since in the true spirit of The Attic, the Solovox could be acquired for only a few hundred dollars. The Solovox is much less portable than the Univox – the speaker cabinet is larger, and made of solid wood. 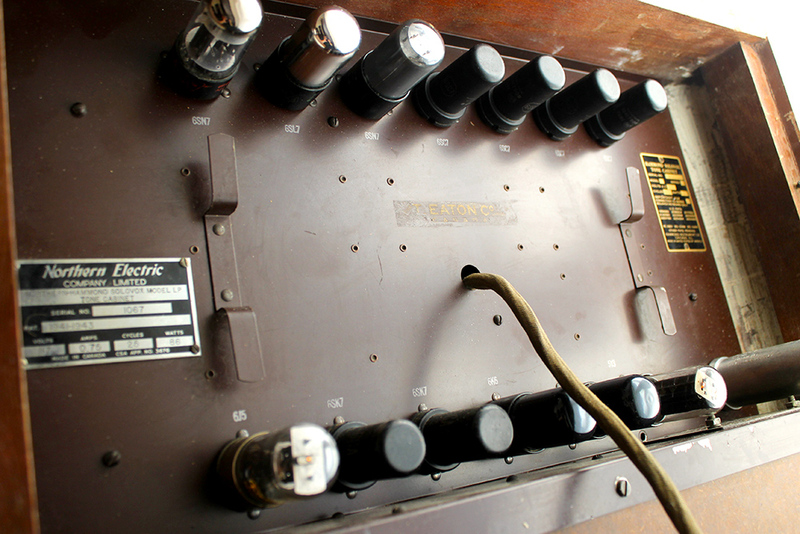 A fearsome array of valves (‘tubes’) are exposed on the back panel, as well as some WWII grade wiring. BASS, TENOR, ALTO, SOPRANO These are the four main oscillators, which are basically the same waveform, but just in different octave registers. MUTE Mute emphasizes odd harmonics over even harmonics, changing the timbre a little bit. ATTACK Adjusts the speed of the attack, fast or slow. VIBRATO Turns on or off vibrato. Vibrato still slightly audible when off. 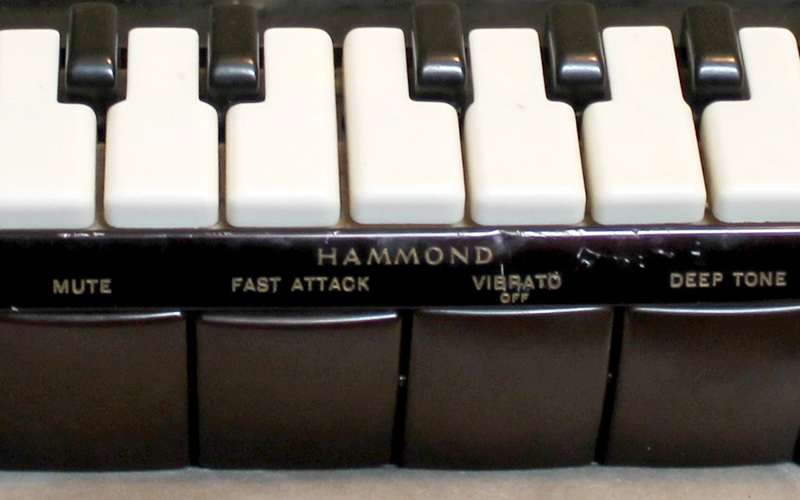 DEEP, FIRST, SECOND, and BRILLIANT These are what Hammond calls the formant controls, essentially resonant filters in various bands. When the button is ON that band is enabled. 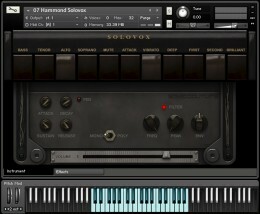 The Solovox has a much more ‘organ-like’ character than the Univox, the switches functioning more like traditional stops. 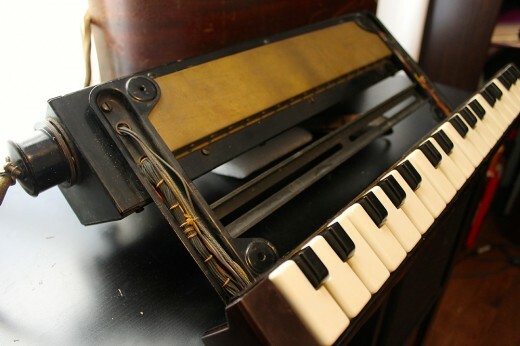 Within The Attic collection of instruments it provides an interesting halfway point between the synths and the Philicorda transitor organ, with a much more aggressive tone than the latter.